Global Korean restaurant, Bibigo, introduces a new menu featuring their trademark Kimchi and Korean favourite 치맥Chimaek (Chicken and Beer). The best part of all is that this new menu is expected to last throughout the remainder of the year! If you are a fan of Kimchi, don’t miss out Bibigo’s newest addition of 김치전Kimchi Pancake and 김치 찌개Spicy Kimchi Stew, as both are sure to whet your appetite! The Kimchi Pancake is crispy and serves as a good appetizer or side dish to share, while the Spicy Kimchi Stew is fragrant and flavourful, with just enough spice, and definitely best enjoyed with a bowl of rice. We were pleasantly surprised by the taste of the Kimchi, which is made from Bibigo’s trademark recipe, and bound to make you taste the difference. Also, new on the menu, is the Seafood Noodle (only available at both the Suntec and Raffles City outlet). 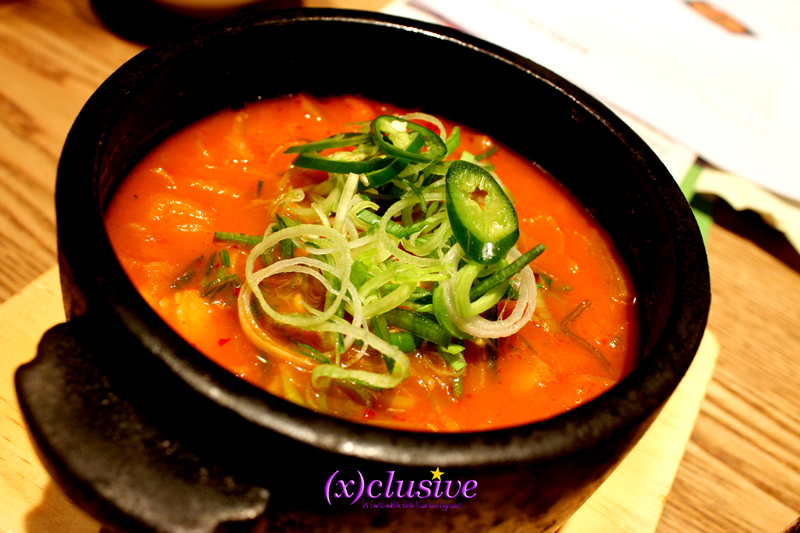 While the seafood tastes fresh and the udon noodles are chewy, the flavour pales in comparison to the Spicy Kimchi Stew. If you think the Spicy Kimchi Stew is too much for your taste buds, then the Seafood Noodle might be a better choice! The last addition to the menu is the Chimaek, which aptly combines the words ‘chicken’ and ‘maekjoo‘ (beer), which is a popular combination in Korea. Bibigo’s version serves up Gangnam Chicken, where patrons can dip it in with the sauce of your choice – pepper and salt, soybean or sweet and spicy. The chicken is crispy on the outside but well-cooked and tender on the inside. We enjoyed the bits of green vegetables (onions and spring onions) cleverly wrapped within the coating of the fried chicken, which adds a refreshing touch. The combo comes with all three dips and a small dish of pickled radish and lime, and the recommended serving is for two pax. Do try the traditional dip of pepper and salt with the bite-sized pieces, followed by a gulp of ice-cold Hite beer – definitely refreshing! The menu will be available at all three outlets (save for the Seafood Noodle, which is only available at the Suntec outlet) till the end of the year. ← (x)clusive! : Are uDiva enough for Lee Minho?